A team of scientists has smashed the record for the shortest-ever laser pulse, producing one that lasts just 67 billionths of a billionth of a second—which is short enough to use it to image individual electrons orbiting the nuclei of atoms. 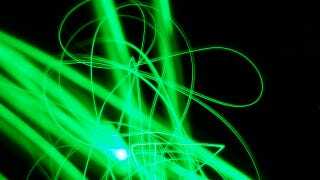 The team of researchers, from the University of Central Florida, has built on technology used to produce the previous shortest laser pulse in 2008. Back then, already-short laser pulses were fired into a focussed jet of inert gas to make them even shorter. But the UCF guys have gone a step further. By passing the pulses through zinc foil, certain parts of the pulse can be slowed relative to others—which forces all the colors within the pulse to be squeezed into a slightly shorter pulse duration. The results are published in Optics Letters.